I have been having some blogging issues lately...my scheduled posts, don't post when scheduled...argh! I have really been itching to buy some new stamping stuff...but I am kind of on a spending freeze, due to the economy (bleck!). I do feel a Papertrey ink order in my future though...I need some ribbon, paper, and some of those yummy buttons!!! I bought a copy of the new SU! catty this week (since I am no longer a demonstrator), and found some really cute stuff in there...I decided to dust off some of my old SU! sets and ink them up again (they have been very neglected!). 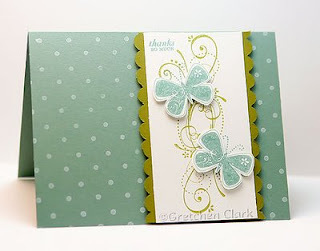 So happy to see you working your magic with Stampin' Up! stamps! LOVE this card ... it's beautiful !!! This card is so great!!! Love the polka dotted background.